March can be difficult time at the farmers market if you’re a baker. You’re already sick of the apples and pears of winter, but it’s too soon for rhubarb season. After this particularly snowy winter, most of us are thinking wistfully of the peaches, cherries, and berries that flooded the markets this summer. But bakers, take note, there’s more at the farmer’s market than just fresh produce — you can also use the excellent local cheeses in a number of sweet and savory baked goods. If you’re not too tired of apples just yet, you can use a local cheddar cheese in a cheddar pie crust, which is always a great option to spice up apple pie. You can use a local blue cheese in scones, biscuits, or a quickbread. Or, if you’re feeling like dinner, use a local cheese on your pizza, which is what I did. This pizza recipe uses a feta cheese with tomato and basil from Keswick Creamery, a Pennsylvania farm that sells at the Dupont Circle FRESHFARM Market. All their cheese is made from raw Jersey milk, and their cows are exclusively grass-fed. Unlike grocery store feta cheese, which can be dry and harsh, this is creamy and tangy, with just a hint of tomato and basil. Because I wanted the flavor of the cheese to stand out, this pizza is simple — topped with just the cheese, fresh basil, and a little olive oil, salt, and pepper. Feel free to adapt this recipe to your tastes and whims. Pizza with very thinly sliced apples and Havarti would be lovely, as would a cheddar pizza topped with crumbled bacon. A good pizza crust is the perfect vehicle for whatever is in season, making it an excellent recipe to have on hand for the local shopper. 1. In a small bowl, whisk together the flour, instant yeast, and sugar. Whisk in the salt (this keeps the yeast from coming into direct contact with the salt, which would kill it). 2. Make a well in the center and pour in the water. Using a rubber spatula or wooden spoon, gradually stir the flour into the water until all the flour is moistened and a dough just begins to form, about 20 seconds. It should come away from the bowl but still stick to it a little, and be a little rough-looking, not silky smooth. Do not overmix, as this will cause the dough to become stickier. 3. Pour the oil into a 2-cup measuring cup (to give the dough room to double in size) or a small bowl. With oiled fingers or an oiled spatula, place the dough in the oiled cup and turn it over to coat on all sides with the oil. Cover it tightly. If you want to use the dough soon, allow it to sit at room temperature for 1 hour or until doubled. For the best flavor development, make the dough at least 6 hours or up to 24 hours ahead, and allow it to sit at room temperature for only 30 minutes or until slightly puffy. Then set the dough, still in the measuring cup, in the refrigerator. Remove it 1 hour before you want to put it in the oven. 4. Preheat the oven to 475 degrees 1 hour before baking. Put an oven shelf on the lowest level and place a baking stone on it before preheating. 5. With oiled fingers, lift the dough out of the measuring cup or bowl. Holding the dough in one hand, pour a little of the oil left in the cup or bowl onto the pizza pan, and spread it all over the pan with your fingers. Set the dough on the pan and press it down with your fingers to deflate it gently. Shape it into a smooth round by tucking under the edges. If there are any holes, knead it very lightly until smooth. Allow the dough to sit for 15 minutes, covered, to relax it. 6. Using your fingertips, press the dough from the center to the outer edge to stretch it into a 10-inch circle, leaving the outer ½ inch thicker than the rest to form a lip. If the dough resists stretching (as will happen if you have activated the gluten by overkneading it), cover it with plastic wrap and let it rest for a few minutes longer before proceeding. 7. Brush the surface of the dough with any remaining olive oil. Cover it with plastic wrap and allow it to sit for 30 to 45 minutes, until it becomes light and slightly puffy with air. 8. Set the pizza pan directly on the hot stone and bake for 5 minutes. 9. 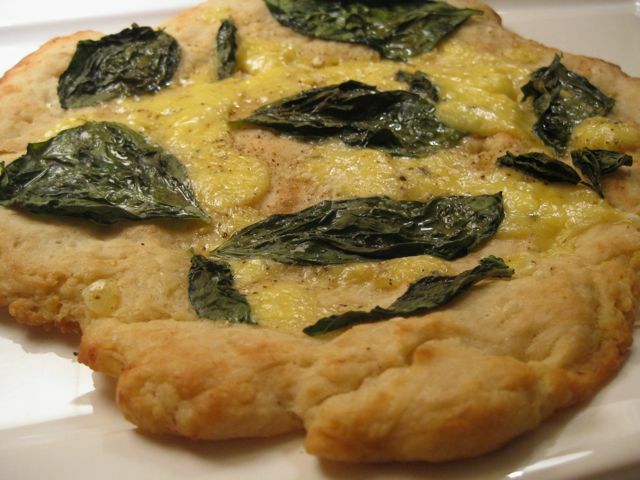 Remove the pan from the oven and spread the cheese and fresh basil leaves over the dough. Lightly drizzle pizza with olive oil, and season with salt and pepper to taste. Return the pan to the stone for 5-10 minutes or until the toppings have melted and the crust is golden; or, for an extra-crisp and browned bottom crust, using a pancake turner or baker’s peel, slide the pizza from the pan directly onto the stone. After 2 minutes, slip a small metal spatula under one edge of the pizza; if the bottom is golden, raise the pizza to a higher shelf. 10. Transfer the pizza to a cutting board and cut with a pizza wheel, sharp knife, or scissors. Serve hot.